High-end home theater savvy, beefy 7-channel power, and impeccable construction meet in Denon's remarkable AVR-3803. High-end home theater savvy, beefy 7-channel power, and impeccable construction meet in Denon's remarkable AVR-3803. The sound is powerful, pristine, and totally enveloping, thanks to 110 watts x 7 channels of Denon's high-current amplification. An advanced 32-bit SHARC processor drives a wealth of surround options, including Dolby® Digital EX, DTS-ES®, DTS Neo:6 and Dolby Pro Logic II. You also get decoding for DTS 96/24 discs  this new format enables video DVDs to deliver 5.1 soundtracks in the same 96kHz/24-bit resolution that multichannel DVD-Audio uses. And Denon's exclusive Widescreen 7.1 mode lets you turn any surround source into thrilling 7.1 audio! 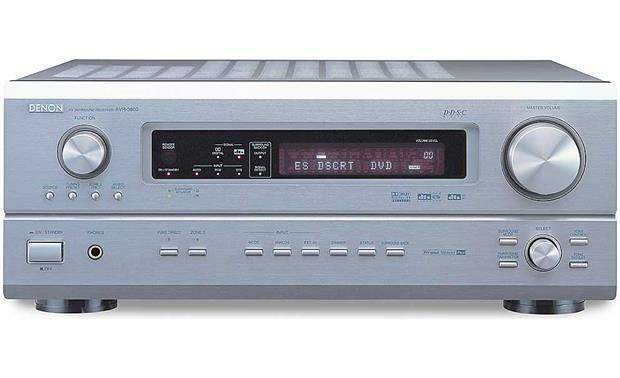 Bringing high-end A/V performance into a real world price range has always been a Denon specialty, but they've outdone themselves with the AVR-3803. This receiver boasts 16 Burr-Brown 192kHz/24-bit DACs (that's 2 per channel!) in differential configuration, for incredible precision from all your digital sources. Another high-end home theater feature is the Audio Delay control, which lets you correct the lip-synching problems that crop up occasionally on digital video sources like DVDs and HDTV broadcasts. And in the convenience department, Denon's video conversion lets you send a variety of video sources to your main TV via a single S-video or component video connection. Another high-end bonus: Denon's renowned AL 24 (ALPHA 24) processing, which employs sophisticated interpolation to produce analog smoothness from 16- to 24-bit stereo digital audio. For the cleanest possible stereo sound, Pure Direct mode shuts off power to the video circuitry and front-panel display. With analog sources, Pure Direct also shuts off the digital circuitry, too. This versatile receiver also offers two dual-room/dual-source A/V options  use the preamp outs with another receiver, powered speakers, or a TV in your second room, or step to 5.1 sound in your main listening room and let the AVR-3803 power a pair of stereo speakers in the second room. The learning/multibrand remote features an LCD and programmable macros for advanced system control. The AVR-3803's heavy-duty construction includes an anti-resonant chassis, a massive power supply, and large capacitors. Denon's DDSC-Digital configuration treats your audio to a series of single-function circuit blocks. With D/A conversion, A/D conversion, surround decoding, and other DSP each handled by its own dedicated block, every function is optimized, and so is your sound! Scrupulous isolation of each block also ensures ultra-rigorous standards of signal purity. Power Supply: The AVR-3803 is designed and constructed for the highest quality sound. A huge power transformer has been connected in the power section where it is combined with a rectifier diode and a large block capacitor to ensure a large, stable supply of electrical current. Accordingly, the receiver boasts high output power of 110 watts for each of the 7 channels. 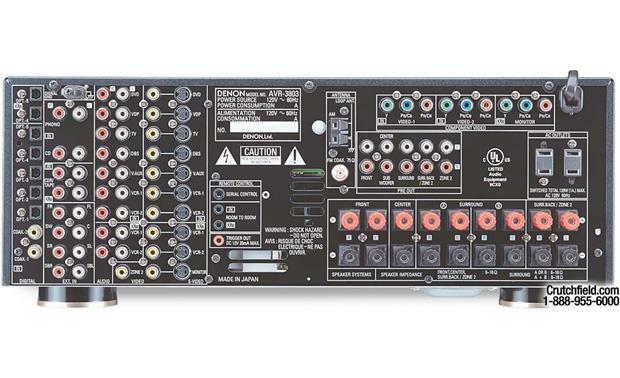 Digital Surround Processing: The AVR-3803 features the new Analog Devices Melody 100 (Hammerhead SHARC) 32-bit floating point, high speed digital surround processor, operating entirely in the digital domain, to deliver accurate performance from digital sources such as DVD, LD, and DTV. 24-bit/192kHz Digital-to-Analog Conversion: Two Burr Brown linear PCM-1791 24-bit/192kHz high-resolution DACs are included for each channel, giving the AVR-3803 a total of 16. The 192kHz sampling and 24-bit word length capabilities of the DACs allows you to play high-resolution recordings and hear the increased clarity, detail and dynamic range of those recordings. 24-bit/192kHz Analog-to-Digital Conversion: The AVR-3803 is capable of 24-bit/192kHz A/D conversion, allowing it to provide especially accurate signal conversion. Analog to digital signal conversion is not applied to analog signals received by the 7.1 multi-channel inputs; analog signals received by the 7.1 multi-channel inputs are sent directly to the speaker and preamp outputs. 24-bit/192kHz Digital Interface Receiver: The AVR-3803 includes a Digital Interface Receiver that distinguishes various types of digital input signals, including 24/192 and 24/96 stereo PCM signals, performs the appropriate signal processing, and transmits the information to the DSP block. Wide Screen Mode: Denon has developed a Wide Screen mode which recreates the effects of the multiple surround speakers found in movie theaters. The result is 7.1-channel sound taking full advantage of the surround back speakers, even with Dolby Pro Logic or Dolby Digital/DTS 5.1-channel signals. DTS 96/24: The AVR-3803 can decode DVD-Video software recorded in DTS 96/24, which allows high-quality 24-bit, 96kHz audio playback in all channels with full-quality, full-motion video. High resolution 96/24 audio playback from ordinary DVD-Video recordings is limited to only two channels with some limitations on the picture. ALPHA 24 Processing: The AVR-3803 includes Denon's renowned 24-bit ALPHA processing technology that reproduces digital signals in a waveform with the smoothness of analog signals. This technology thoroughly suppresses annoying quantization distortion and faithfully reproduces the delicate musical details of low-level signals. ALPHA 24 processing works in 2-channel Stereo, Direct, Pure Direct modes. Pure Direct Mode: In addition to surround sound playback, the AVR-3803 lets you enjoy pure 2-channel stereo sound as well through its Pure Direct mode. In Pure Direct mode, power to the video circuitry and the front panel display is turned off to thoroughly minimize adverse influences from these circuits on the audio circuits. During analog audio input, power to the digital circuitry is also automatically turned off. Furthermore, Denon's AL24 processing is added to the 2 front channels during 2-channel linear PCM input, enabling the playback of sound with remarkably high transparency. Direct Mode: Similar to the Pure Direct mode, the Direct mode allows you to achieve good quality 2-channel sound while watching images. In this mode, audio signals bypass such circuits as the tone circuit and are transmitted directly. Dual Surround Speaker Mode: The AVR-3803 provides the ability to connect two different sets of surround speakers, and place them in the appropriate locations in your home theater room, so that you can enjoy both movie soundtracks and music listening, with optimum results and no compromise. With movie soundtracks, a set of dipole/bipole surround speakers mounted on a side wall close to the ceiling may provide the best results. With music, the use of direct radiating surround speakers mounted in the rear corners of the room more closely resembles the configuration of recording/mixing studios. 5/7 Channel Stereo: The front left channel signals are output to the surround and surround back signal left channels, the front right channel signals are output to the surround and surround back signal right channels, and the in-phase component of the left and right channels is output to the center channel. This mode can be used to enjoy stereo sound from all speakers in the room. Variable Gain Volume Control: The receiver's volume control allows you to make fine adjustments of 0.5dB in an extended useable range of -80dB to +18dB. In addition, the signal-to-noise ratio in the useable area has been improved. Multi-Zone A/V Output: The AVR-3803 provides a Multi-Zone Output function and a Select function that let you output different sources to multiple zones. Sources can be selected for output to an additional zone, in addition to the main room. Multi-room Zone 2 can have fixed or variable pre-amp output along with a composite video feed. The AVR-3803's Power Amplifier Assign function lets you assign the 2 Surround Back (SB L/R) amplifier channels when the system is not configured for 7.1 to instead drive the Multi-room Zone 2 speakers with 110 Watts per channel output power, while still providing 5 discrete amplifier channels to drive all speakers in a 5.1 configured home theater room. Component Video Switching: In addition to composite and S-video switching, this receiver has two sets of component video inputs and one set of component video (monitor) outputs. Each of the component video inputs is assignable to different input sources. A high-performance relay is used to switch signals, and a high-frequency range of up to 100MHz is supported, giving it the ability to pass HDTV signals. 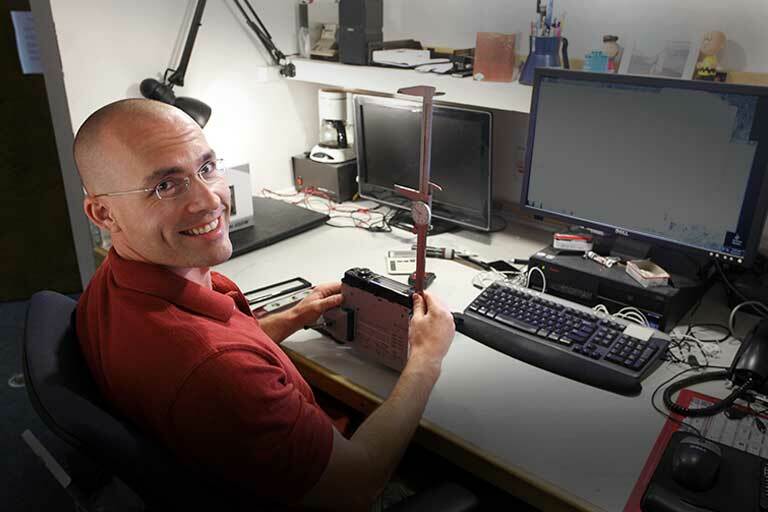 Video Conversion Function: The AVR-3803 is capable of up-converting video signals, allowing the highest picture quality available from all connected video gear. Video signals input along composite video cables are output from the composite, S-video, and component video monitor outputs. Signals input by S-video cables are output from the composite, S-video and component video monitor outputs. Down-converting from component video signal to S-video or composite is not possible. On-Screen Display (OSD): An OSD can be displayed on your television for easy system setup. Depending upon the OSD Setup mode, the OSD can be displayed from the composite, S-video and component video monitor outputs. 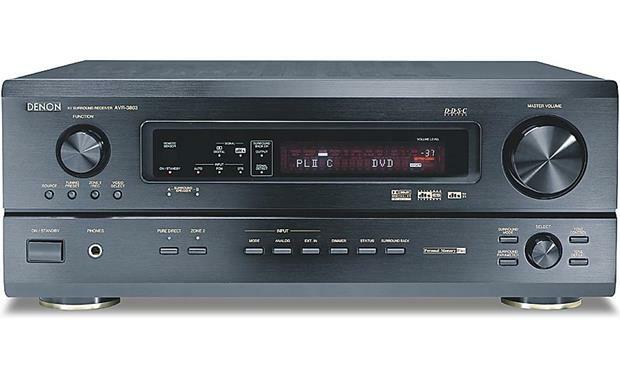 7.1 Multi-Channel Inputs: The AVR-3803 is equipped with a 7.1-channel wideband (up to 100kHz) input to accommodate present and future multi-channel formats, such as DVD-Audio or SACD. Selectable Crossover Setting: This receiver supports subwoofer crossover switching with a choice of 5 frequencies: 40, 60, 80, 100, and 120 Hz. This lets you more accurately match the performance characteristics of the subwoofer to the main speaker system. Audio Delay: While watching a DVD or other video source, the picture on the monitor may seem delayed with respect to the sound. When this happens, you can adjust the audio delay to delay the sound and synchronize it with the picture. Personal Memory Plus: The Personal Memory Plus function automatically memorizes the surround modes and input modes selected for the different input sources. When an input source is selected, the modes stored in memory for that source are automatically recalled. The surround parameters, tone control settings and playback level balance for the different output channels are memorized for each surround mode. Multibrand A/V Learning Remote (RC-921): The AVR-3803 comes with a newly-developed, fully-backlit, infrared remote control with a small LCD screen and the most frequently used keys in the center. It is pre-programmed to control the receiver and other Denon A/V components. In addition, the remote is pre-coded for multiple brands of CD players and recorders, MiniDisc player/recorders, DBS Satellite receivers, VCRs, Cable boxes, TVs, DVDs, Laserdiscs, and Cassette recorders. The remote can also "learn" the codes of other remotes if that component is not included in the Denon remote's library of preset memory codes. 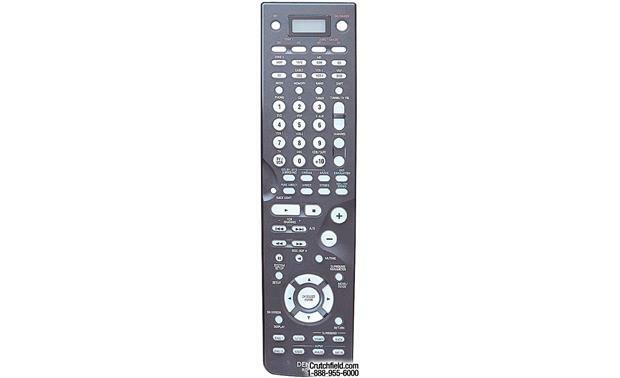 System Call (Macros): This remote can be programmed to transmit a series of commands with a push of a single button. For example, you can program the remote to turn on the receiver's power, select the input source, turn on the monitor TV's power, turn on the source component's power, and command the source component to begin playback, all with one push of a button. You can program up to 10 commands each into the remote's "Call 1" and "Call 2" buttons. Serial Control/Room-to-Room Ports: The AVR-3803 has a mini-jack input for a connection to an external remote control system, such as AMX or Crestron. If you are using a Denon RC-616 Infrared Re-transmitter, you can connect the inputs and outputs directly to the receiver using the room-to-room mini-jack inputs. Speaker Outputs: The AVR-3803 has nine speaker outputs for Front left and right, Center, Surround A left and right, Surround B left and right, and Surround Back/Zone 2 left and right. All speaker outputs have binding post connectors, allowing you to connect the speakers with bare wire, banana plugs or pin connectors. The binding posts are spaced too far apart to support dual banana plugs, and the collar surrounding each post prevents the use of spade lugs. Dual Surround Speakers: As mentioned above, this unit offers A and B surround speaker outputs. This allows you to connect two sets of surround speakers, placing them in different locations in the room, to optimize the music and movie experiences separately. In the menu, you can choose to use Surround A or B, or Surround A + B. Note: The minimum impedance for Surround A or B is 6 ohms, and for Surround A + B is 8 ohms. Digital Inputs/Outputs: This receiver has 7 assignable digital inputs and 2 digital outputs. There are 5 optical digital inputs, with two of them (Opt 4 and Opt 5) coupled with an optical digital output. There are also 2 coaxial digital inputs. Each digital input can be "assigned" to a different input source, or turned off if not in use. Pre-out Jacks: This receiver has a total of 10 pre-out level RCA jacks for the following channels: Front left and right, Center, Subwoofer, Surround left and right, Surround Back/Zone 2 left and right, and Zone 2 left and right. These jacks allow you to connect the outputs to integrated amplifiers or powered speakers. Note: When the Power Amp Assignment for the Surround Back channels is set to "Zone 2", the pre-out signal for the selected Zone 2 source is output through the Surround Back/Zone left and right outputs. When the Power Amp Assignment is set to "Surround Back", the pre-out signal for the selected Zone 2 source is output through the Zone 2 left and right outputs. Headphone Jack: This unit has a gold-plated standard 1/4" headphone jack on the front panel. When headphones are plugged into the headphones jack, the speaker-level and pre-amp level outputs are automatically turned off. 12V Trigger Output: The AVR-3803 has a mini-jack output to send a 12-Volt DC "turn-on" signal to another component that accepts a 12V trigger, such as a power amplifier. The 12V trigger output can be assigned to as many source inputs as desired.